The second phase of BMW’s ChargeForward pilot makes an even stronger case for electric vehicles as a grid resource. Electric vehicles are cleaner than their gasoline-powered counterparts on a life-cycle basis, research shows. But they are not emissions-free. The total climate impact of operating an EV depends largely on the sources of electricity used to charge up the car’s batteries. The U.S. electricity sector is steadily transitioning to lower-carbon energy resources. But what if the impact of dirty power plants could reduced or eliminated immediately by fueling up EVs with renewable energy that’s already available? Well, that’s what BMW has been working on with Pacific Gas & Electric. In the second phase of the automaker’s ChargeForward pilot program, BMW has been developing the capability to align EV charging with renewable energy generation. PG&E provides a renewable energy projection to the car company, which is used to optimize charging in a way that maximizes the amount of renewables used to power participating vehicles. During a weeklong pilot scheduled around the commemoration of Earth Day in April, participating electric BMWs received more than 57 percent of their energy from renewable energy resources, on average. Nineteen EV owners received grid electricity that was powered 80 percent by renewable energy during the week. This spike was primarily driven by a significant increase in daytime charging during PG&E’s peak solar hours, which was achieved through customer incentives and messaging. In the future, if BMW can execute this charging program on a much larger scale, it will be “easier and cheaper for utilities to add more solar energy onto the grid,” he added. BMW and PG&E started testing EV charging as a grid resource back in 2015 and throughout 2016. Last year, the stakeholders released a report with their phase one findings as they started to kick off phase two. There are a few critical differences between the two phases, Langton explained. In the first phase, there were around 100 participants in the program. In the second phase, that number has grown to more than 350. BMW also broadened the types of vehicles involved from just i3s to all of the company’s plug-in vehicles, including electric versions of the 3 Series, 5 Series and X5 SUV. The use cases have evolved too, he said. Initially, BMW focused specifically on demand response and load curtailment. The automaker would get a signal from the utility to decrease the load on its vehicles and would then respond. The company tested its ability to reduce demand, ironed out some of the technical details, and examined the driver response. 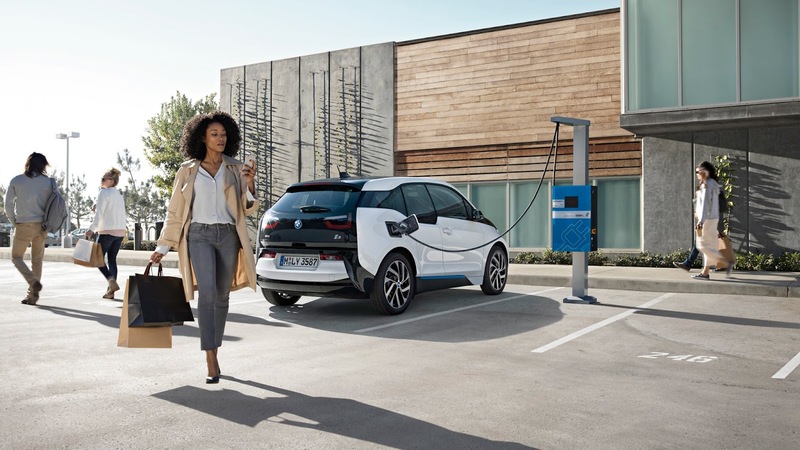 In the second phase, BMW has been focusing even more on the customer experience by giving users more information on the smart-charging process and the impact of their participation. The use cases have also become much more sophisticated. The demand response events are longer, extending from one to two hours, and beyond. And in this phase, there is no stationary battery to back up the EV performance, which there was in phase one. BMW also started doing “optimization” use cases in phase two — such as charging when there’s an abundance of renewables on the grid. Under the current arrangement, the automaker has moved away from responding to event-based signals called by the utility. Instead, BMW optimizes vehicle charging over a period of time. So if an EV is parked for five hours, BMW will pick the best three hours to charge based on driver needs and what’s happening on the grid. The pilot initially responded only to wholesale market electricity price signals, charging up when it was cheapest. For Earth Day, BMW optimized for renewable energy, and it continues to test out both use cases. Langton said his team has also done some testing of use cases where they controlled the vehicle when it was away from home. BMW has always had the ability to do remote control, because it uses the on-board vehicle telematics system for its communications, rather than a charging station. BMW’s software back-end speaks directly to the vehicle, telling it to start charging or to stop, or to schedule charging for later. This means that customers can participate regardless of what kind of charging infrastructure they use. BMW has always had telematics capabilities, but only started using them for remote control applications during the second phase of the ChargeForward pilot. The aim is to see how that increases the company’s ability to respond to utility signals, and how that impacts the flexibility of vehicle charging. To carry out these kinds of optimizations, BMW asks participating customers to simply provide a departure time, said Langton. In the renewable energy use case, the EVs will charge up on wind power at night and mostly on solar power during the day. PG&E provides a day-ahead forecast of the hourly renewable supply that they’re expecting, and BMW optimizes against it. In the pricing scenario, BMW relies on publicly available wholesale market pricing data. 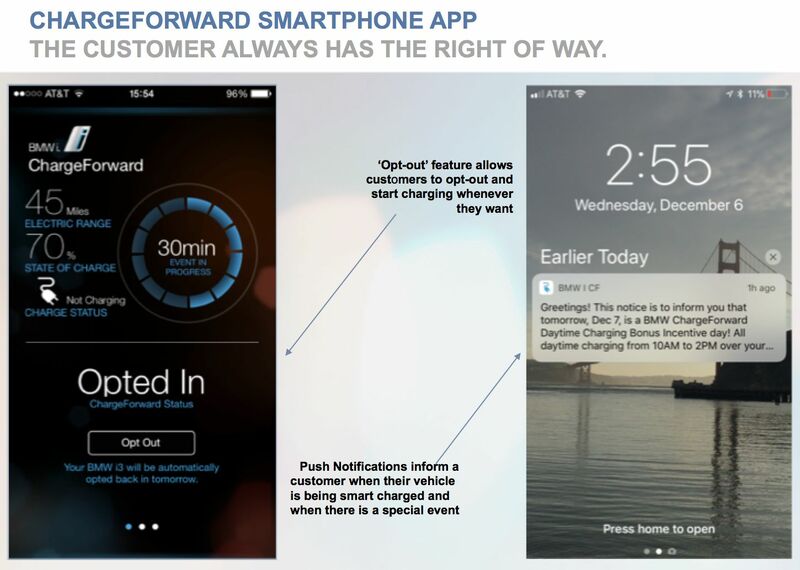 On the customer-facing side, BMW communicates through a smartphone app. In the latest tests, customers could see exactly how much of their charge was provided by renewable energy — which Langton believes is an industry first. Customers are paid up to $300 for taking part in the program, depending on their level of participation. This time around, BMW also conducted user surveys to see how the program was resonating. 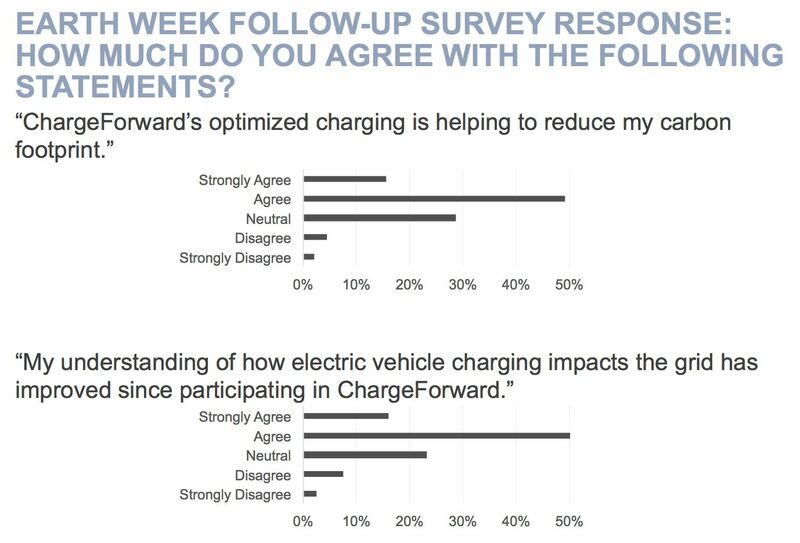 According to Langton, about two-thirds of participants said that they understood how ChargeForward optimized charging and was helping to reduce their carbon footprint. Two-thirds also said they had gained a better understanding of how EV charging affects the grid. Interestingly, residential solar customers and customers on existing green tariff programs were confused by the need to align their charging with renewables. These customers assumed that their EVs were always charging with renewable energy, regardless of the time of day, which is not necessarily the case. Flexible resources that can utilize excess renewable energy generation during the day and help curb the steep ramp in the evening are becoming increasingly important to grid operators and utilities due to ongoing growth in renewables. EV charging is a potential complement to this trend — but BMW’s surveys revealed that there are also some roadblocks. 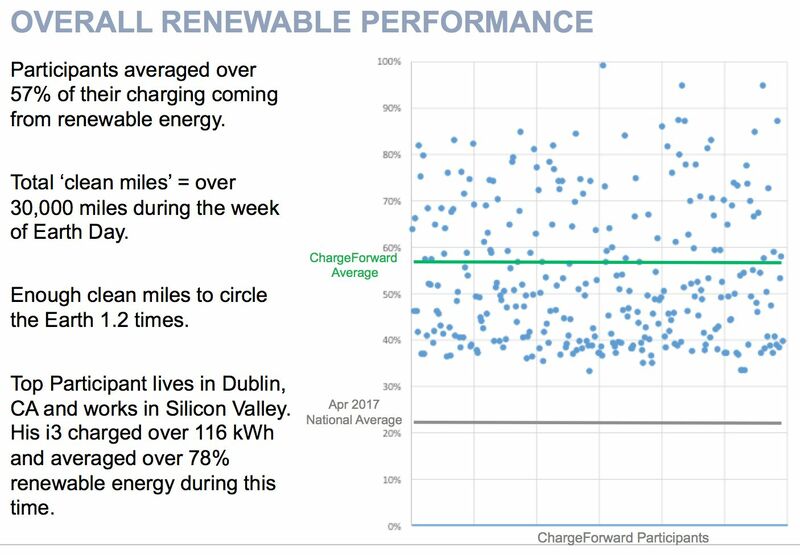 ChargeForward participants reported that high electricity rates for households during the day and a lack of workplace infrastructure made it difficult to participate in daytime charging. The good news is that these factors can be addressed through rate reform and new investments. 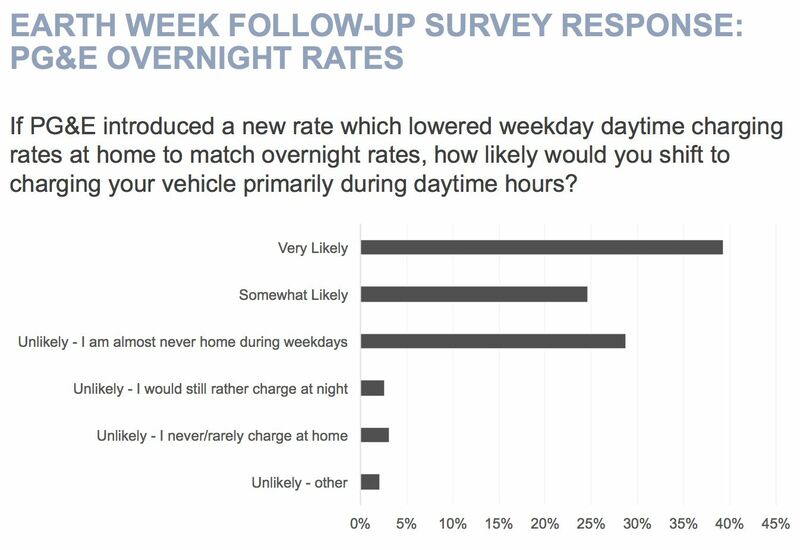 Participants were asked if they would sign up for a utility program that lowered their daytime charging rates when there was a lot of solar on the grid, if they committed to charging primarily during the day. According to Langton, 61 percent of customers said that they would be likely or very likely to participate in a program like that. This is how well-designed programs can “help…make it easier to get more renewables on the grid,” he said. BMW is now working to create a dashboard that would share more EV customer data with the PG&E, so the utility can see how the aggregate load of program participants is increasing or decreasing, which cars are smart charging and which ones are not, and where that charging is happening. Pilot program participants have given BMW their permission to collect this data and share it with PG&E. Tracking the charging behavior of individual EVs, in multiple locations, as well as in aggregate, enables the utility to verify vehicle performance and see EVs as a true grid resource. Trust is a critical piece of the program. Customers won’t agree to hand over control of their EV charging or grant access to their charging data if it’s inconvenient or not secure. As for next steps, Langton said he sees more opportunities for BMW to share data and analysis PG&E to figure out where the utility can do more grid planning with this EV data. This data will allow PG&E to understand where more vehicles might appear on their grid, how much charging that will amount to, and when that charging will occur, Langton said. BMW can then work with the utility to manage that resource. Phase two of the pilot will continue into 2019. In the coming months, BMW will explore more sophisticated ways of controlling EVs, including more action at the local level and combining renewable energy or pricing optimizations with demand response. BMW will also create more tools for customers, Langton said. He wasn’t able to say exactly what those tools would look like, but they’ll help customers “get a better understanding of what’s going on, and help them feel more engaged in how they’re impacting the grid,” he said. In order to do more with the program and expand it to include more electric cars, Langton said BMW needs the California Public Utilities Commission to give utilities more direction. “That’s what will really help us understand what the value is, so that the programs can then be rolled out on an even larger scale and made into multi-year programs,” said Langton. Once the value is evident to the utility, there could be a revenue opportunity for BMW. Today, the ChargeForward pilot is being funded by a California Energy Commission EPIC grant, which converts the incentives for customers. Right now, BMW isn’t making any money off of the EVs as grid resources — from the utility or in the wholesale market.